Empire Today - Awful Experience! We strive to leave a positive impression during our sales appointments and regret that this was not the case. We understand that we have spoken to you in regards to your concerns. For future inquiries please contact us at customersupport@empiretoday.com . My husband and I recently moved into our first home and were looking to replace the carpet in our spare bedroom. We are absolutely appalled by service that we received from the man who came into our home to give us an estimate. Never should a customer be uncomfortable in their own home. While giving an estimate for the one bedroom, the man, who appeared to have been drinking before coming to our home, was walking into other bedrooms in our home that were not being carpeted, lounging on our bed, etc. He then proceeded to say comments to us such as "why did you wait to make an appointment so late", "I've got dinner home waiting for me", and "I've had enough fun here tonight". Additionally, my husband and I wanted to discuss our options over night and get back to the man the following day about our purchase. That is when we were told that we were not able to call him back tomorrow and our business was not worth his $20 commission. He proceeded to tell us angrily that he only makes 4% commission. If we were interested he told us that he would not help us and that we would have to call empire and they could send someone else to our home. As he laughed and packed up his things, he angrily ripped up the tax form and threw it on my kitchen table. Still being the people who we are, my husband asked to help him carry out his carpet samples when he was told no. He then slammed my front door, flew out of my driveway, and sped down the road. Immediately, I called the corporate office where I was told that his manager would be giving me a call. After three days of not hearing from someone, I called the office again. I finally received a phone call five days later from his store manager. We are very disappointed with the service that we received from Empire and can only hope that by telling other individuals, Empire will not have the opportunity to treat others the way that we were treated. Review #936240 is a subjective opinion of User936240. 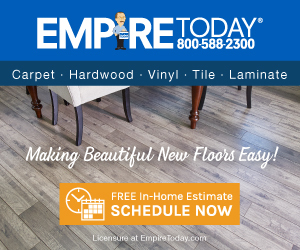 Thank you for warning me off of Empire Flooring. I can't thank you enough. We have read your review and are disappointed to hear that this was your experience. We never want our customer's to feel this way, and assure you that we take matters such as this one very seriously. We will be in contact with you soon to discuss this further.